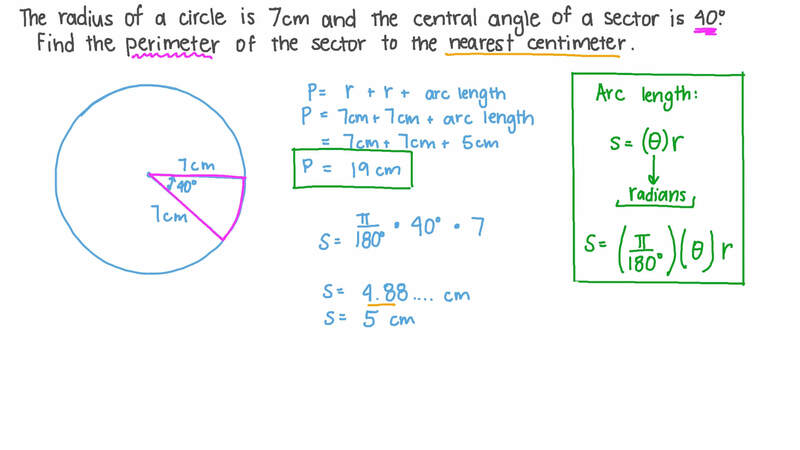 In this lesson, we will learn how to identify when to use the circumference and area formulas of circles, including arc lengths and sector areas. The radius of a circle is 7 cm and the central angle of a sector is 4 0 ∘ . Find the perimeter of the sector to the nearest centimetre. The radius of a circle is 21 cm and the angle of a sector is 1 2 3 ∘ . Find the area of the sector giving the answer to the nearest square centimetre. The diameter of a circle is 78 cm and the arc length of a sector is 22 cm. Find the area of the sector, giving your answer to the nearest square centimetre. The area of a circular sector is 3 872 cm2 and the arc length is equal to the radius. Find the perimeter giving the answer to the nearest centimetre. A circle 𝑀 has a radius of 42 cm, where 𝑀 𝐴 and 𝑀 𝐵 are two radii in the circle, and 𝐴 𝐵 = 1 6 c m . Determine the area of the circular sector 𝑀 𝐴 𝐵 to the nearest square centimetre. 𝐴 𝐵 𝐶 is an equilateral triangle with a side length of 66 cm. An arc is drawn from a circle with centre 𝐴 cutting 𝐴 𝐵 at point 𝐷 , 𝐴 𝐶 at point 𝐸 and touching 𝐵 𝐶 at point 𝐹 . Find the area of the part of the triangle bounded by 𝐵 𝐷 , 𝐶 𝐸 , 𝐵 𝐶 and the arc 𝐷 𝐹 𝐸 giving the answer to two decimal places. A pendulum of length 26 cm swings 5 8 ∘ . Find the length of the circular pathway that the pendulum makes giving the answer in centimetres in terms of 𝜋 . With circles 𝑀 and 𝑁 touching at 𝐴 , the shaded area is 331 cm2. Given that 𝑀 𝑁 = 3 . 7 c m , determine the sum of the two radii correct to the nearest hundredth. Given that the area of a circular sector is 1 4 of the area of a circle. Find, in radians, the central angle, correct to one decimal place. Find the circumference of a circle whose area is 9.625 cm2. Use 𝜋 = 2 2 7 . 𝐴 𝐵 is the diameter of a semicircle of length 36 cm and 𝑚 ∠ 𝐴 𝐵 𝐶 = 4 1 ∘ . Find the area of the shaded part of the diagram giving the answer to two decimal places. The area of a circular sector is 122.5 and the length of the arc is 5 cm. Find the perimeter of the sector giving the answer to the nearest centimetre. Answer the following questions for the circle shown. Work out the circumference giving your answer to two decimal places. 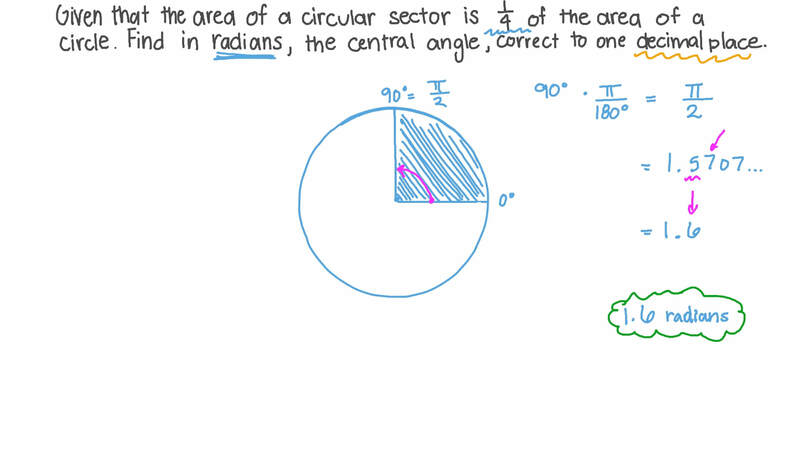 Work out the area of the circle giving your answer to two decimal places. Work out the circumference giving your answer in terms of 𝜋 . Work out the area of the circle giving your answer in terms of 𝜋 . The radius of a circle is 37 cm and the area of a sector is 555 cm2. Find the length of the arc giving the answer to the nearest centimetre. The radius of a circle is 40 cm and the angle of a sector is 2.9 rad. Find the area of the sector giving the answer to the nearest square centimetre. The circle of centre 𝑀 and radius 𝑟 is divided into four sectors, each of perimeter 75 and arc length 33. Determine the radius 𝑟 and the area of each sector 𝐴 s e c t o r . Use 3.14 as an approximation value for 𝜋 .
𝐴 𝐵 and 𝐴 𝐶 are two chords in the circle 𝑀 where 𝐴 𝐵 = 𝐴 𝐶 = 4 c m and 𝑚 ∠ 𝐴 = 8 0 ∘ . Find the area of the minor sector 𝑀 𝐵 𝐶 giving the answer to the nearest square centimetre. The area of a circle is 1 539 cm2 and the arc length of a sector is 36 cm. Find the area of the sector giving the answer to the nearest square centimetre. A circle has a radius of 4 cm and a segment has a central angle of . Find the area of the segment giving the answer to two decimal places. Determine the circumference of a circle whose area is 88,704 cm2, taking 𝜋 = 3 . 1 4 . What is the circumference of a circle whose area is 2 5 2 𝜋 cm2. Express your answer in terms of 𝜋 . The perimeter of a circular sector is 58 cm and the arc length is 26 cm. Find the area of the circle giving the answer to the nearest square centimetre. Determine, in terms of 𝜋 , the circumference of a circle whose area is 9 2 1 6 𝜋 .